It might be more appropriate to talk about Uncle Sam around the Fourth of July, when symbols of patriotism abound. He dresses in red, white, and blue, after all, and sometimes has stars on the brim of his hat and stripes on his pants! Somehow, though, I think more Americans think of their Uncle Sam in April when the deadline to file taxes comes along. I think nearly every family has a relative like Uncle Sam. He always seems to want your money. He’s not too good at living within his means and before you know it, he’s back wanting more! But he is family and we all want him to succeed. He is the personification of the United States of America itself and we all have a stake in his future. 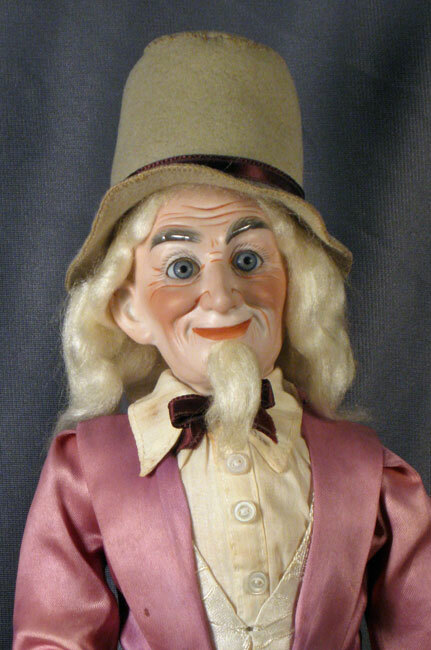 Uncle Sam doll made in Germany around the turn of the century. The origin of Uncle Sam can be traced back to 1813 when Samuel Wilson, a meat packer from Troy, New York supplied beef for the army during the War of 1812. The barrels of beef were marked “U.S.” for the United States, but the soldiers began referring to them as “Uncle Sams”, a nickname for Samuel Wilson. The image of Uncle Sam as we know him is attributed to Thomas Nast, the prolific political cartoonist of the nineteenth century who also gave us the image of Santa Claus. The most famous image of him, however, is attributed to James Montgomery Flagg, who created the Uncle Sam made famous on the World War I recruiting poster pointing sternly with the caption “I Want You”. This plaster figure of Uncle Sam is dated 1917 and is captioned “Rollin ’em up,” referring to preparations to fight in World War I. With his tall, lean and lanky physique matched by his colorful attire, Uncle Sam is a natural for collectors if you can find him out there in Collectorland. His popularity was at its peak from about the late nineteenth century (especially around the Spanish-American War of 1898) through World War II. He was usually portrayed in a positive light during that time when America was becoming a stronger and more influential player among the family of nations. During the Vietnam War he wasn’t quite so popular. 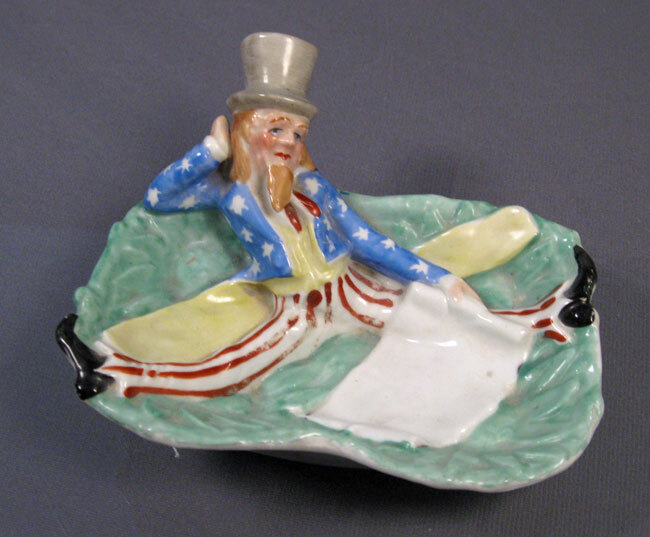 Uncle Sam pin tray from the early 20th century. 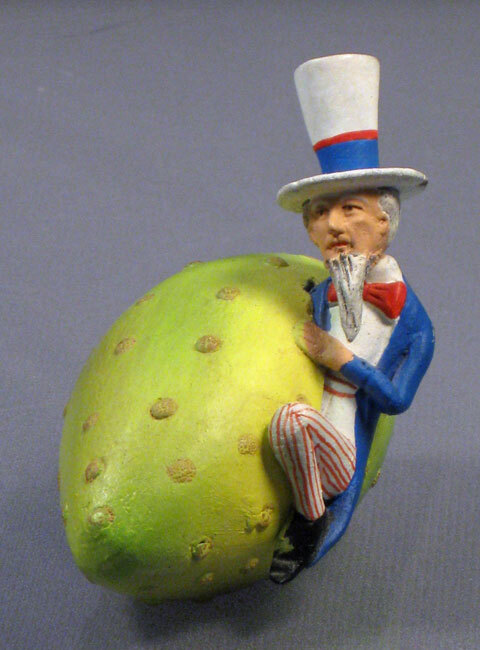 Artist-made figure of Uncle Sam in a Pickle. It’s hard to date exactly because historically Uncle Sam always seems to be in a pickle! 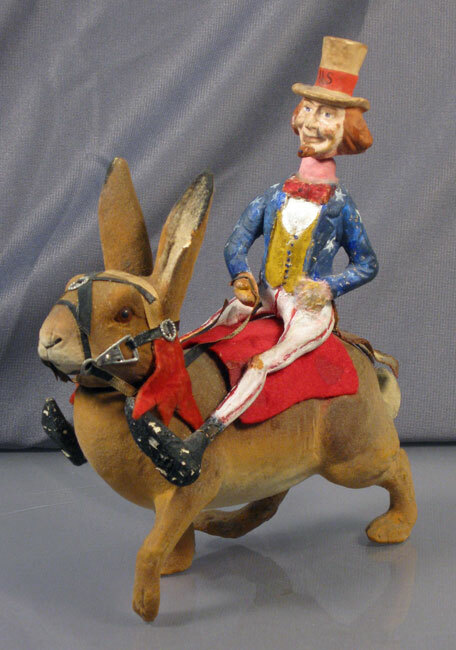 German candy container of Uncle Sam riding a rabbit. This well-detailed piece was probably made around the Spanish American War (1898). Today the image of Uncle Sam can often be found in craft shops as a patriotic decoration. Unfortunately he is often portrayed with a Santa Claus type beard and moustache instead of the long thin beard grown only on his chin. How did the song go – “Don’t know much about history”! 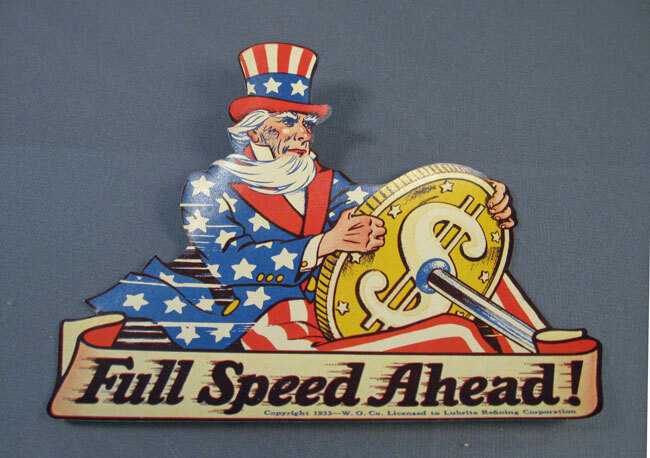 Many of our Uncle Sam items were purchased back in the seventies and eighties. Today, finding them is difficult and can be expensive. As always with collecting, however, you never know what lies ahead at the next flea market, auction, or yard sale. This flask is a souvenir from Canada during Prohibition when many Americans headed north to get a drink! 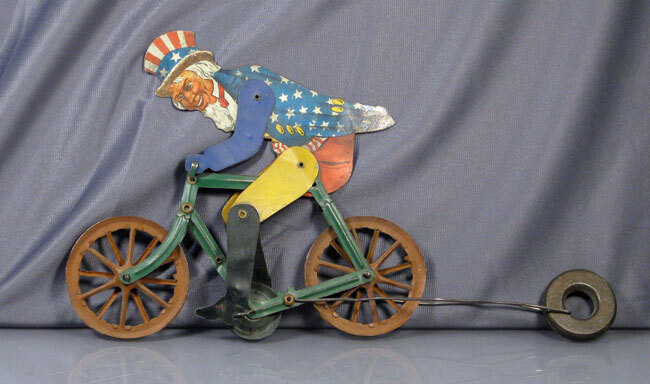 This Uncle Sam on a bicycle toy was made between the wars by the A. C. Gilbert Company. He would ride along a string moving his legs. This decal is dated 1933 and reflects the optimism that the election of Franklin D. Roosevelt would soon put an end to the Depression. 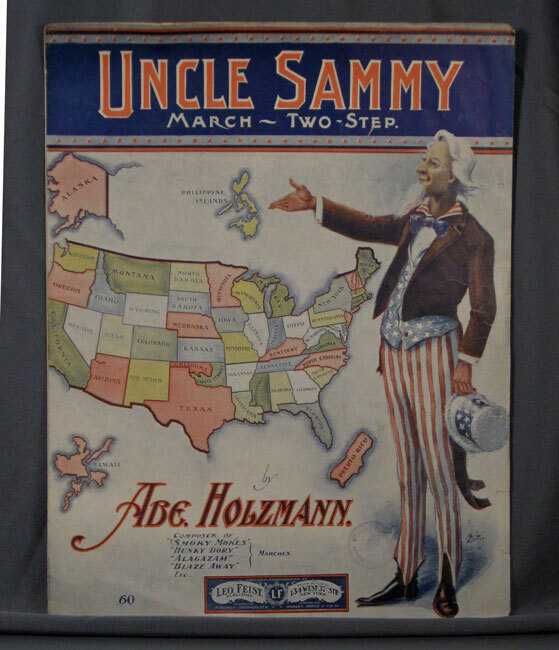 This piece of “Uncle Sammy” sheet music is dated 1904 and shows Uncle Sam with a map of the U.S. and its territories, some of which were acquired at the end of the Spanish-American War. This entry was posted in 1900's, 1910's, 1920's, 1930's, 1940's, Americana, Dolls, Ephemera, Historical, Jim, Political, Toys, WWII. Bookmark the permalink. 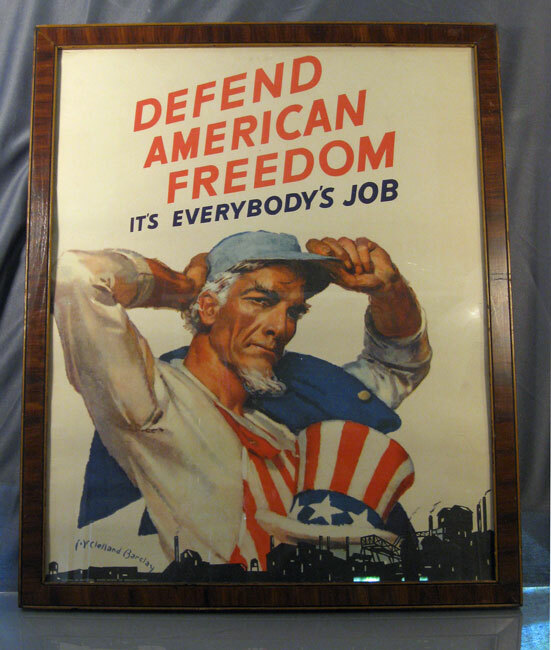 3 Responses to Uncle Sam – He Collects From Us So Why Not Collect Him? Where did you find the Uncle Sam plaster statue that is pictured on this page? It was found at a flea market in Adamstown, Pa.